Bake pie crust and let cool. Wash and slice strawberries (I left some whole and sliced the larger ones). In a saucepan, whisk water, cornstarch and sugar together. Bring to a boil and stir for a couple of minutes until thickened. Remove from heat and whisk in gelatin until dissolved. Let mixture cool for 10 minutes. Arrange strawberries on top of pie crust. Pour gelatin mixture on top of strawberries. Place in fridge to set for a couple hours. Serve with whipped cream if desired. Makes 6-8 servings. If you’re looking for a super quick and delicious pie, try this simple fresh strawberry pie! This crowd-pleaser can be made ahead of time and stored in fridge – then just garnish with whipped cream when ready to serve. Here is a set of glass pie pans that are at a very reasonable price. I’ve been craving strawberry pie. 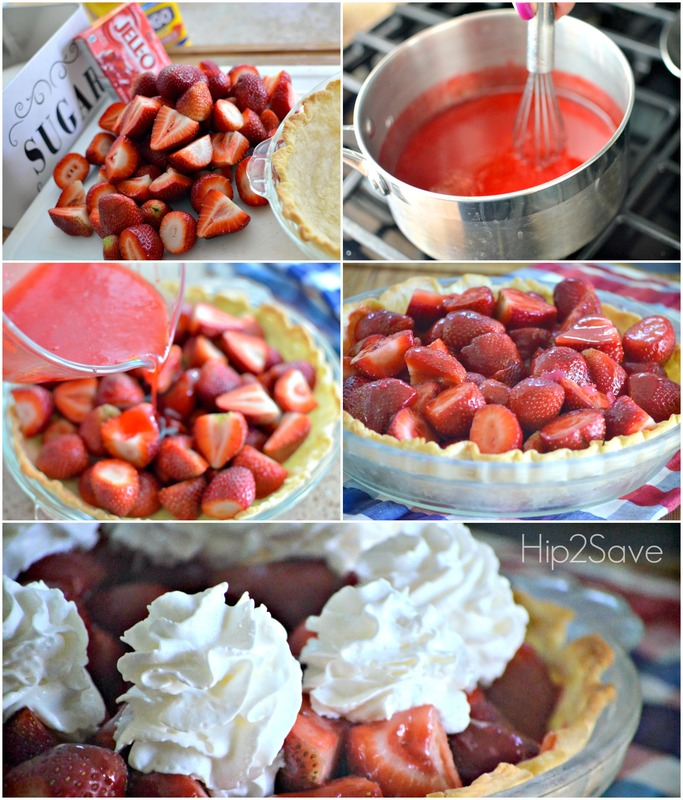 I mix the strawberries with the container of strawberry glaze and toss that in a pie crust with whipped cream. Never been a big fan of the gelatin route. Thanks for the idea, I’ll have to try the strawberry glaze. I don’t use gelatin at all especially knowing where it comes from. Great recipe, used it for many years. It’s very close to the Shoney’s strawberry pie of the 80’s. That is how Europeans eat it but not the pie crust. It is usually on a cake like a sponge or bisquit. Sounds awesome! I can’t wait to try this one! I’ve made this before–easy and delicious! Didn’t have gelatin. So, I added diced strawberries to the corn starch and sugar, bringing it to a smimmer for 2 minutes. PERFECT! Is it possible to use frozen strawberries for this?